If you are chronically sick or disabled and the products are for your personal use. "Chronic" meaning lasting a long time. Full details can be found at the HM Revenue and Customs website under "VAT relief for disabled people; HMRC Reference: Notice 701/7 (August 2002". Important note: not all products are eligible for VAT exemption relief. 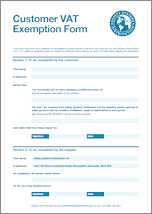 The government requires that you complete a VAT Exemption declaration form. If you are in any doubt as to whether you are eligible to receive goods or services zero-rated for VAT you should consult us. 1.1 Who can purchase VAT-Exempt goods and services? You can zero rate the supply to an eligible customer as detailed in paragraph 3.1 of Notice 701/7 of any other equipment and appliances that have been designed solely for use by disabled people. It is not sufficient for zero-rating that the equipment or appliance is merely destined or intended for use by a disabled person, or is mainly purchased by disabled persons. For example, general purpose equipment such as most computer hardware, ordinary or orthopaedic beds, orthopaedic or reclining chairs may benefit a disabled person, but are designed for general use or for use by disabled and able bodied people alike. Such products are not eligible for relief. You can zero rate parts and accessories which you supply to an eligible customer as defined in paragraph 3.1 of Notice 701/7 provided that they were designed solely for use in or with goods which themselves qualify for VAT relief as described elsewhere in this section. Parts means integral components without which the equipment is incomplete. Accessories means optional extras which can be used to improve the operation of the equipment, or enable it to be used, or to be used to better effect, in particular circumstances. VAT relief does not apply to general use items such as standard batteries, even if these were purchased to be used within an item which is eligible for VAT relief. If the batteries were solely designed to operate within the eligible item however, they would be eligible for relief. You may zero rate the supply to an eligible person of your services of repairing or maintaining any of the goods specified above. You would not have to pay the VAT if you or the person you are buying the good for is "chronically sick (have a long-term illness) or disabled" - see sub-paragraph 1.2.1, and the goods and services are purchased or acquired for their personal or domestic use - see paragraph 1.5. 1.2.1 What does "chronically sick or disabled" mean? It does not include a frail elderly person who is otherwise able-bodied or any person who is only temporarily disabled or incapacitated, such as with a broken limb. If a parent, spouse or guardian acts on behalf of a "chronically sick or disabled" person, your supply is treated as being made to that "chronically sick or disabled" person. The term "disabled" is used throughout this notice and means "handicapped" or "disabled or chronically sick". You cannot zero rate all goods and services to all charities. You should, therefore, take extra care in checking that a charity is eligible for VAT relief before applying. 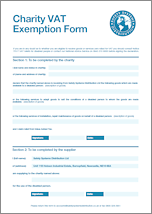 Supplies of goods to charities will qualify for VAT relief where the goods are made available by the charity to a disabled person for their personal or domestic use - see paragraph 1.5. There are certain other circumstances when supplies of goods listed at paragraph 1.4 will qualify for VAT relief - see Notice 701/1 Charities and Notice 701/6 Charity funded equipment for medical, veterinary etc uses. 1.3.1 What is a charity? There is no distinction for VAT purposes between those charities registered with the Charity Commission and those that are not required to register. However, unregistered charities claiming zero-rating may need to demonstrate that they have 'charitable status'. This may be achieved from their written constitution or by the recognition of their charitable status by the Inland Revenue. Further information on VAT relief's available for charities is contained in Notice 701/1 Charities. 1.5 What does for "domestic or personal" use mean? "Domestic or personal" use means that the supply must be made available specifically for the use of an eligible individual (or series of eligible individuals). 1.6 Can anyone pay for the eligible goods and services? 1.7 What if a customer is unable to make a written declaration? If you are unsure if you would qualify for VAT exemption or need assistance completing the exemption form, please contact us and we will be happy to assist.